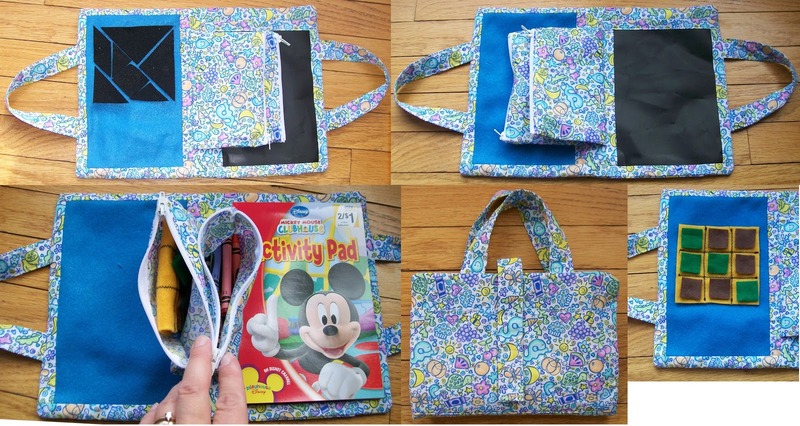 Cute bag to keep children "busy" - great for waiting rooms, church, etc. There's a felt board (with included instructions for a tic tac toe game and tangrams) and a chalkboard on the inside - as well as a pocket for a coloring book...plus 2 zipper pockets to hold the felt pieces and the chalk & crayons. On the outside there's 2 more pockets to hold more "stuff". This pattern has an Unlimited commercial license ~ please see PDF info page for details.